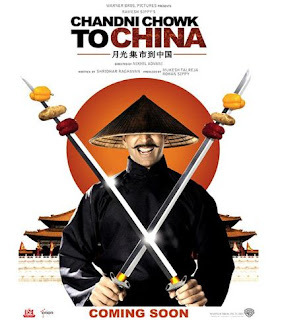 Chandni Chowk to China is a Hindi film which released on 16th January 2009. It is directed by Nikhil Advani and stars Akshay Kumar and Deepika Padukone in the lead roles, with Hindi cinema veteran Mithun Chakraborty and Hong Kong action cinema veteran Gordon Liu among the co-stars. In addition to being shot in China, many parts of the film were shot in Bangkok, Thailand, although some of the China scenes were shot in sets in the Shanghai Film Studio. Distributed in the U.S. and co-produced by Warner Bros., it is the third Bollywood movie made and distributed in partnership with a major Hollywood studio, following Sony's Saawariya (2007) and Walt Disney Pictures' animated feature Roadside Romeo (2008). It is Warner Bros. Pictures' first Hindi film.